I had a great day at the farmer’s market. There was a lot of traffic and we sold a lot. Thanks to everyone who stopped by! I came home with one bag of kale and one onion left, and I wanted to use them for dinner so they wouldn’t go to waste. The result was delicious so I thought I’d share it with you. I started by dicing my onion and browning about half of it in a little olive oil in a large skillet. 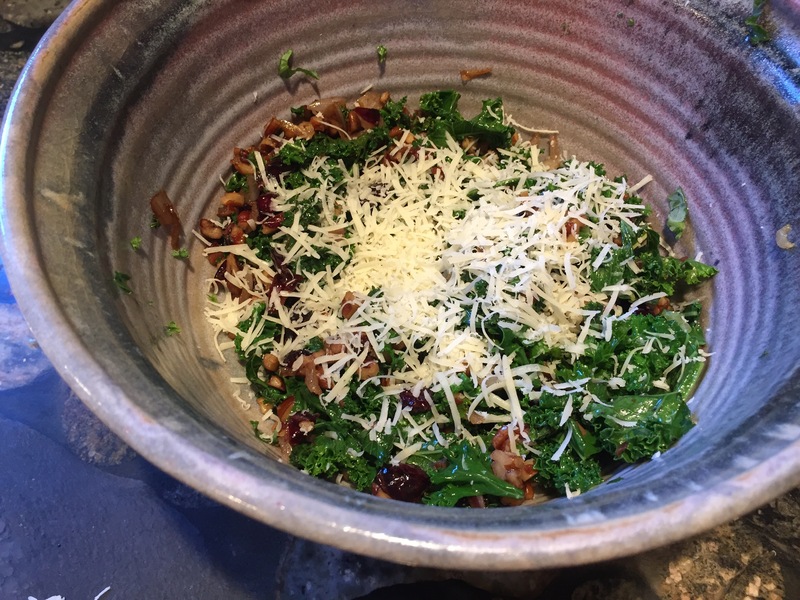 While that cooked I collected the rest of my ingredients: craisins, chopped walnuts, some sweet raspberry vinegar, my bag of kale (cleaned, destemmed and chopped), and some cheese to grate over the finished product. 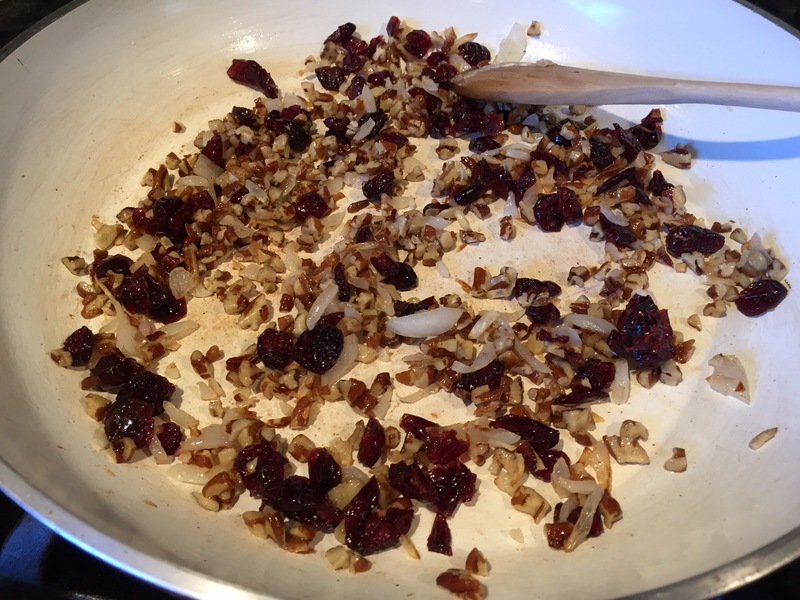 Once the onion browned, I added a couple tablespoons each of nuts and craisins to the skillet and let them cook for a minute or two. 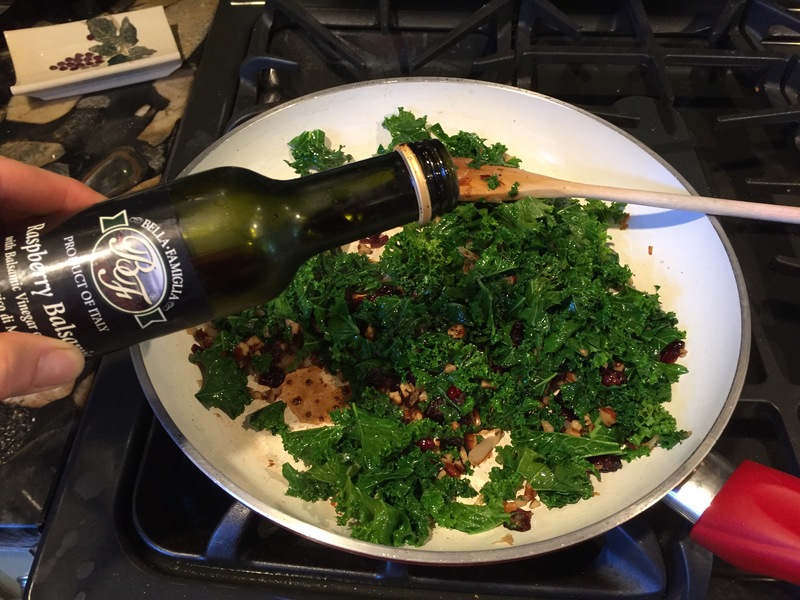 Next I added the prepared kale and a splash more olive oil. I stirred it continuously until the kale wilted. Then I mixed in a splash of my vinegar and a little salt and pepper. I poured it into a serving bowl and grated some Romano cheese on top. We ate it as a side dish with some burgers, fresh off the grill. The nice thing about this general recipe is that you can use what you’ve got. I’ve done dried cherries instead of craisins. You could also try raisins. Most nuts will work or maybe even try seeds. Use plain balsamic vinegar if you don’t have raspberry flavored. And the cheese is wide open too. One of my favorites to use is goat cheese, for the creaminess it adds. 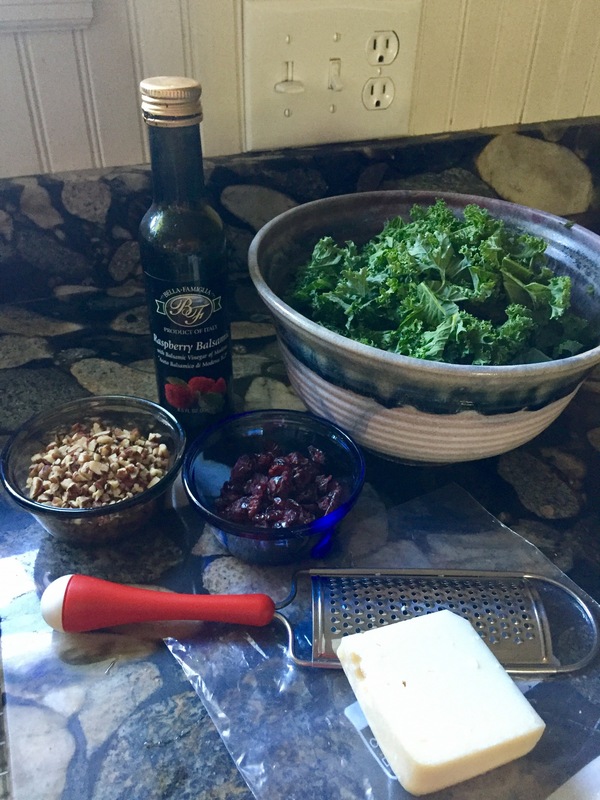 It’s the combination of greens with the sweet and salty that makes this dish work so get creative and find a new way to enjoy that kale that’s growing rampant in your garden (or at least it is in mine!) right now.